The bulk of this report is focused on the coming wave of workforce automation and other automation technologies. But a variety of technological innovations – from industrial robots in manufacturing to the office productivity tools that have transformed the nature of white collar office work – have already had a profound impact on the nature of work in the present day. 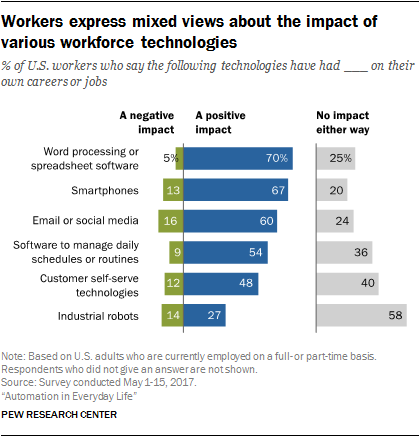 When asked about the impact of these and other technologies on their own jobs and careers, today’s workers express decidedly mixed views. Many view these technologies in a positive light, but substantial shares view them as damaging (or at best neutral) to their own career prospects. Moreover, the survey finds that the benefits of these tools are most likely to accrue to workers with high levels of formal educational attainment. It also finds that workforce automation has already impacted a minority of today’s workers in the form of lost jobs or wages – and that many of these workers view technology as a broadly negative influence on the trajectory of their own careers. Today’s workers express a diversity of views when asked about the impact that various technologies have had on their own jobs and careers. A substantial share of workers indicate that technologies such as word processing or spreadsheet software (70%), smartphones (67%), and email or social media (60%) have had a positive impact on their own careers. Meanwhile, 54% say they have been positively impacted by software that manages their daily schedules or routines, and 48% report a positive impact from technologies that help customers serve themselves on their own. Around one-quarter (27%) feel that industrial robots have impacted them positively in one way or another in their jobs or careers. At the same time, in each instance a minority of workers – ranging from 5% in the case of word processing and spreadsheet software, to 16% in the case of email or social media – indicate that these technologies have had a negative impact on their own jobs or careers. Larger shares feel that these technologies have not had much impact on them in either a positive or negative way. This sentiment is most prominent in the case of industrial robots: 58% of workers feel that these devices have not had much of an impact on them personally. Workers generally express more positive than negative views when asked a more general set of questions about the impact of all the various technologies they might have used throughout the course of their careers. Roughly half of workers (53%) feel that technology in general has made their work more interesting, but 12% say it has made their work less interesting – and around one-third (34%) say it hasn’t had a major impact either way in this regard. Similarly, a plurality of workers (46%) feel that technology has increased their opportunities for career advancement – but 13% say it has decreased their opportunities for advancement, and 40% say it has made no difference one way or another. Workers are more divided on whether technology has made their work more or less demanding: 39% say it has indeed made their jobs more demanding, only modestly larger than the shares who say it has made their work less demanding (29%) or that it has not had much impact either way on the relative demands of their jobs (32%). For each of the six specific technologies measured in the survey, workers with at least a four-year college degree have markedly more positive views compared with those with high school diplomas or less. These differences are most pronounced in the case of office productivity tools such as word processing or spreadsheet software: There is a 45-percentage point difference in the share of workers with college degrees (90%) and with high school diplomas or less (45%) who feel these technologies have had a positive impact on them professionally. However, there are also differences of 20 percentage points or more between these groups for several other technologies, including email or social media (27 points), smartphones (22 points), and software that manages workers’ daily schedules and routines (21 points). In total, nearly one-quarter (24%) of workers with high school diplomas or less say that none of these six technologies has had a positive impact on their jobs or careers; for college graduates that figure is just 2%. By the same token, workers with high school diplomas or less are notably more downbeat about the impact these tools have had on their careers relative to college graduates. One-in-ten workers with high school diplomas or less say they have been negatively impacted by word processing or spreadsheet applications; 16% have been negatively impacted by scheduling software tools; and around one-in-five have negative views of the impact of customer self-service tools (18%) and industrial robots (19%) on their own careers. Moreover, large shares of non-college educated workers indicate that these technologies have simply not impacted their careers in any meaningful sense – whether for good or bad. Fully 44% of workers with high school degrees or less say their professional lives have not been impacted one way or the other by word processing or spreadsheet software, for instance, while 35% say the same about email or social media. Generally speaking, workers in the middle educational tier – that is, those who have graduated from high school but who lack four-year college degrees – tend to have attitudes toward technology and work that are midway between these two groups. They express more positive views relative to those with no college experience at all, but less positive views relative to those with four-year degrees or more. 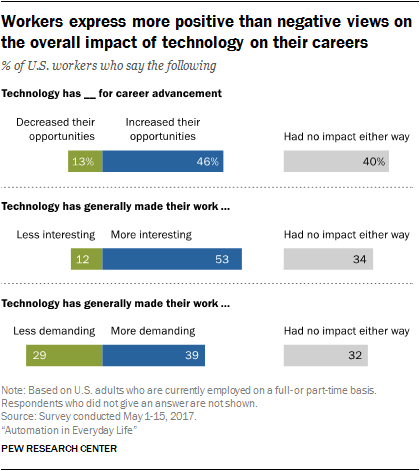 Workers’ views of the broader impact of technology on their careers exhibit similarly pronounced educational differences. Compared with workers with high school diplomas or less, college graduates are substantially more likely to say that technology has made their work more interesting (64% vs. 38%), and to say it has increased their opportunities for career advancement (53% vs. 32%). In terms of the demands of their jobs, college graduates are somewhat more likely to say that technology has made their work more demanding (45% vs. 36%), but also more likely to say it has made their work less demanding (31% vs. 20%). The survey also finds that Americans are being impacted by technology in more tangible ways when it comes to their career prospects. Specifically, 2% of Americans report that they have at some point personally lost a job because their employers replaced their positions with a machine or computer program, and another 5% have ever had their pay or hours reduced for the same reason. In total, 6% of Americans have been impacted by automation in one (or both) of these ways. More broadly, nearly one-in-five Americans (18%) indicate that they personally know someone who has lost a job, or had their pay or hours reduced, as a result of workforce automation. The youngest adults – those ages 18 to 24 – are especially likely to report that they have been personally impacted by automation in one or both of these ways: Some 6% of 18- to 24-year-olds have lost a job entirely due to automation, while 11% have had their pay or hours reduced for that reason. In total, 13% of Americans in this age group have been impacted by automation in one or both of these ways. Part-time workers – 5% of Americans who are currently employed part time say they have ever lost a job due to automation (compared with 2% of full-time workers), and 8% have ever had their pay or hours reduced for the same reason (compared with 4% of those employed full time). Hispanics – 9% of Hispanics have had their pay or hours reduced due to automation technology (compared with 3% of both whites and blacks). Lower-income Americans – 4% of Americans with annual household incomes of less than $30,000 per year have lost a job due to workforce automation, while 6% have lost pay or hours for this reason (these figures are 1% and 3%, respectively, for Americans in households earning $75,000 or more per year). Compared with the rest of the working public, workers who have been personally impacted by automation ­(that is, those who have lost a job and/or had their pay or hours reduced due to the use of robots of computer programs) are significantly more pessimistic about the impact of technology on their own careers. Most notably, 46% of these workers feel that technology has decreased their own opportunities for career advancement, while 34% feel that technology has generally made their work less interesting. These views are shared by just 11% of workers who have not been impacted by automation in this way. This “impacted by automation” group is also substantially more likely than other workers to say that technology has made their work more demanding, albeit by a somewhat smaller margin (54% vs. 38%). Workers who have been impacted by automation are also much more likely than others to say that a wide range of specific technologies have had a negative impact on their jobs or careers. Around one-third say that they have been negatively impacted by industrial robots (36%), smartphones (34%), email or social media (34%), or technologies that help customers serve themselves (31%), while one-in-five cite a negative impact from software that manages their daily schedules or routines (21%) or from word processing or spreadsheet software (20%). In each instance, these shares are at least double those reported by workers who have not been personally impacted by workforce automation technologies in this way.